and decided to turn some of them into Silhouettes. This is my rendition of silhouette art using various late 18th century French fashion plates and a variety of vintage paper theater images from my personal collection. Silhouette portraiture was a popular way to have ones likeness taken in the 17th, 18th and early 19th centuries since they were quicker and less expensive than having a portrait painted. 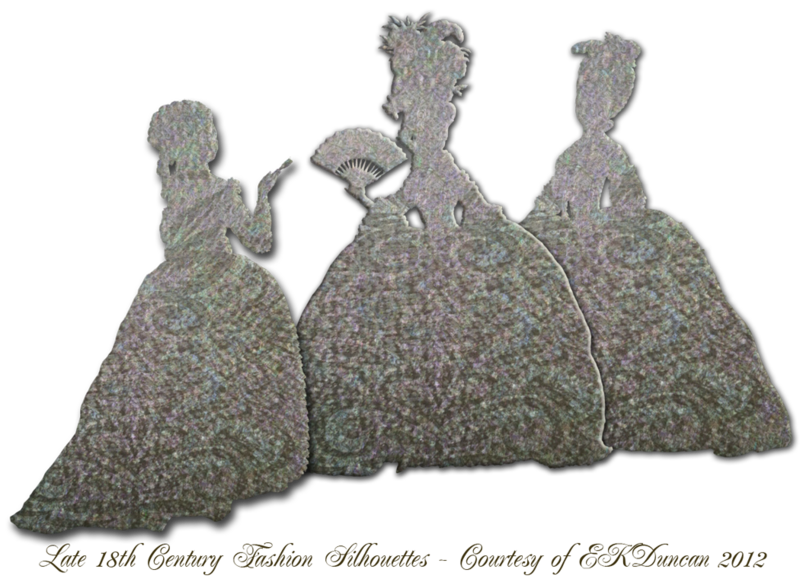 Many times they were done by professional silhouette artists; however, it was also an art form that many genteel ladies added to their repertoire of fashionable skills. 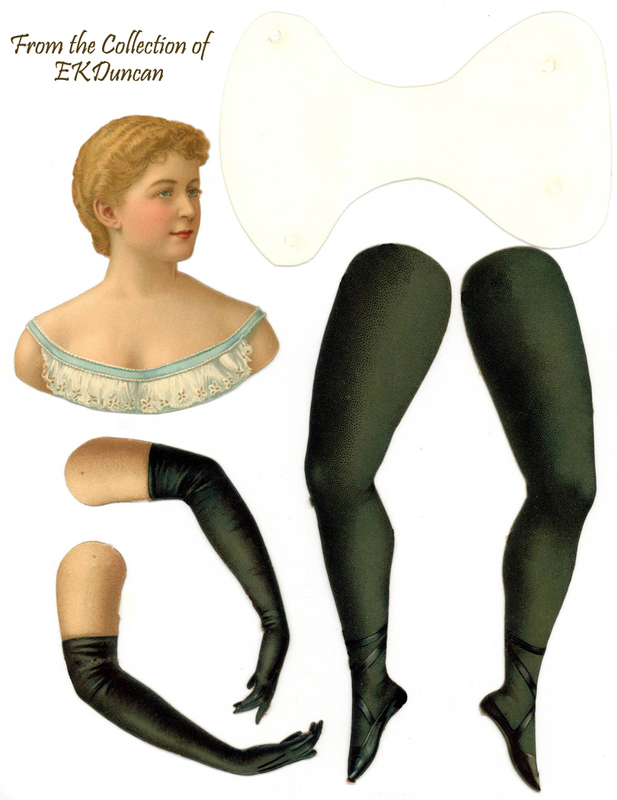 also many historical examples of full body and multi-subject silhouettes. 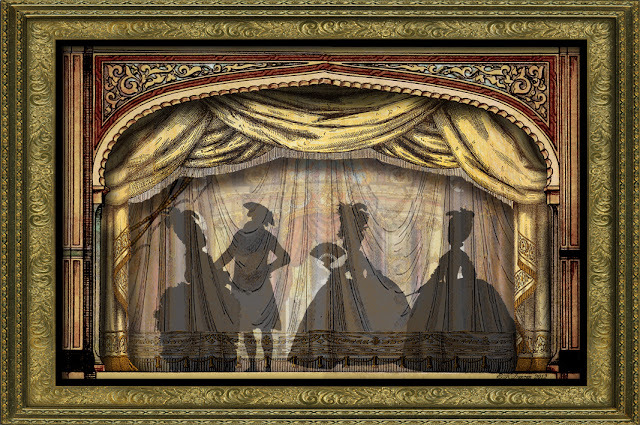 Modern technology and programs like Photoshop are a quick and easy way to convert a png into a silhouette image. 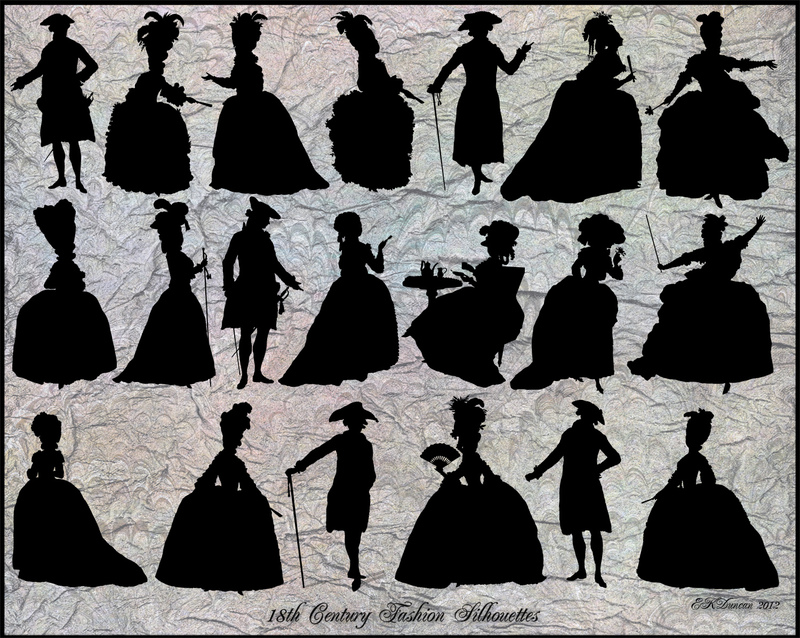 I selected 20 of the vintage fashion pngs I've previously posted about and turned those into silhouettes to use for fun craft projects. by adding creative layers either digitally or by hand. 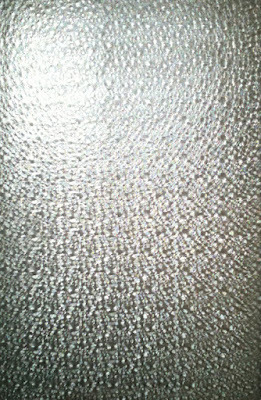 plain paper then attached to decorative paper and cut out to achieve a similar effect. I've created using some of my silhouette figures. 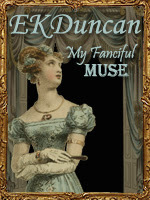 I collect all kinds of vintage images and have an extensive collection of antique book covers. 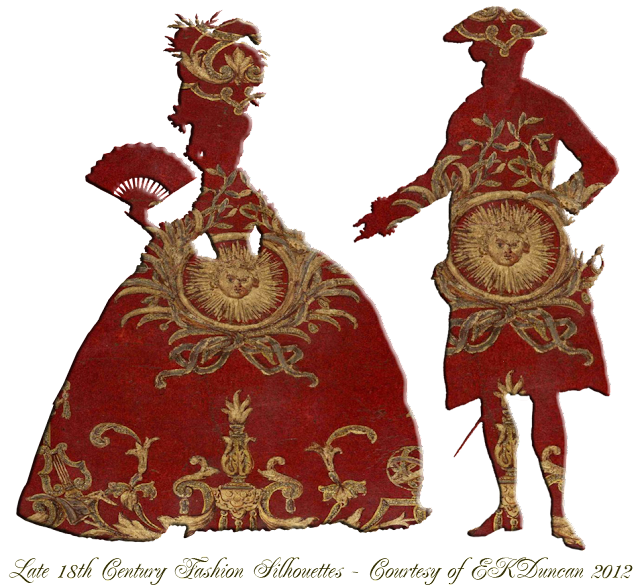 This pair of French dignitaries was created using the image of an old red and gold leather book cover over each silhouette in Photoshop and then beveling the images to get a better outline around each. 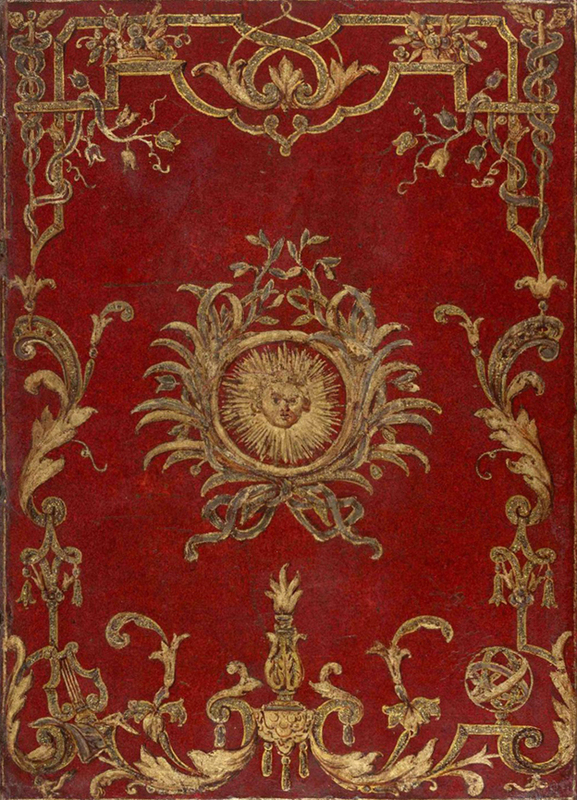 The book cover I used is from a 1717 copy of - Historie de l'academie Royale. 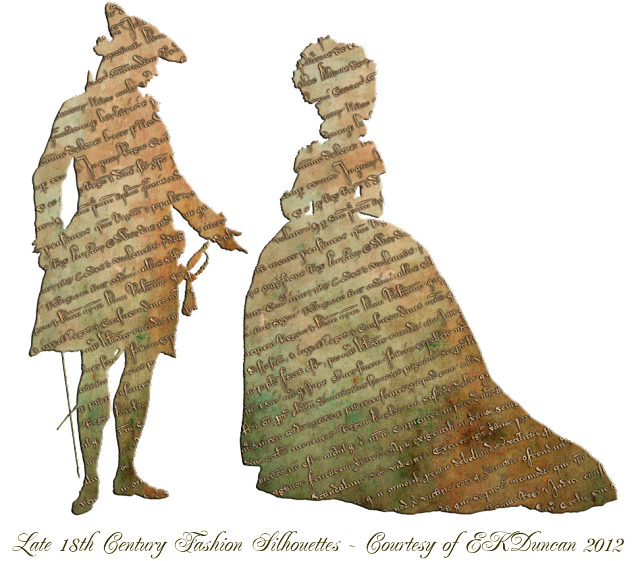 French King, Louis XIV who reigned till 1715 was known as the "Sun King" so I thought this was a perfect match for my couple even though the French fashions depicted are from 1770's. 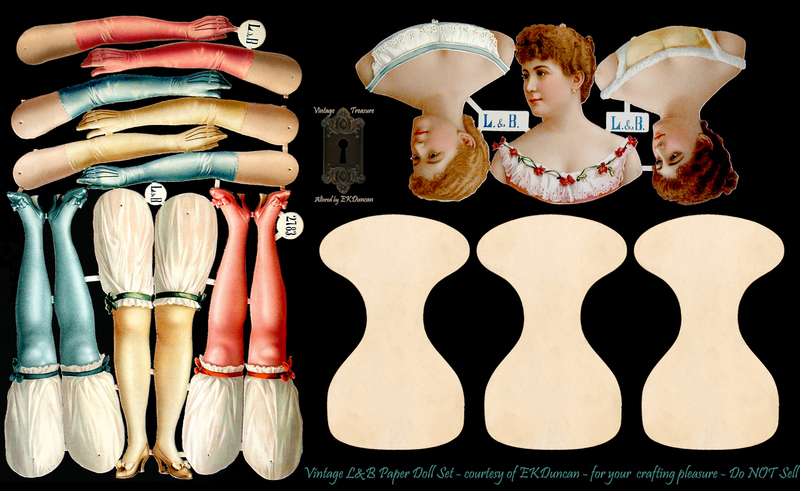 patterns, textures, styles and script from a vintage document. I was going for an antique metal cutout look for this set of fashion figures. The combinations you can come up with when layering over a silhouette are endless. For this trio I layered in different patterns, styles and settings in Photoshop to get a totally different look. This time I wanted something that looked more like etched glass and one of my layers is actually a photograph I took of a piece of privacy glass from an old antique office door. I try and take pictures of interesting items to use as texture layers in Photoshop and funky glass is one of my favorite items to use. The flash even caused a rainbow effect to appear in the glass that gave my trio of ladies a surprisingly fun bit of color. 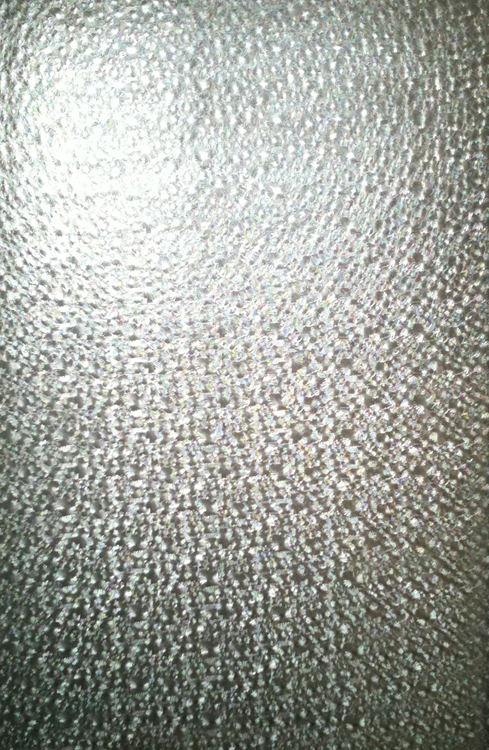 This texture photo and others can be seen HERE at my deviantART gallery. a silhouette figure so here are all 20 for you to play with. Silhouettes are also a lot of fun to use just the way they are in traditional black. I loved the effect they gave my Theater Scene as if the actors are just behind the curtain. 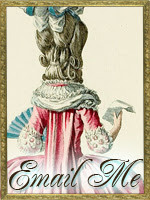 I'll be back later on with more French Fashion plates from the time of Marie Antoinette. J'ai beaucoup aimé tes silhouettes et surtout celles recouvertes avec le livre ancien. Merci La Nonna - Ce sont amusant à faire et le couple rouge à l'aide de la couverture du livre ancien est mon préféré aussi. Thanks La Nonna - These were fun to do and the red couple using the old book cover was my favorite too. I absolutely love these. You create such gorgeous -and entirely original - images out of such diverse material. I'm curious about where you've found the theater frameelents - or do you make these too? Thanks for the pleasure and inspiration! Thanks Amy - I love melding items to make something new. I collect Vintage Toy theater backgrounds and accessories and have altered several in my collection to create my "stage". The stage front is actually a small portion of a toy theater call the Alhambra. I also collect vintage metal picture frames and I've digitally created the one around my scene from parts and pieces of several in my collection. 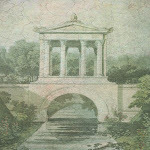 Believe it or not that beautiful scroll work on the frame actually is engraved on the side of one of my antique frames. Je ne savais pas que tu parlais français! Merci Sim - Je n'ai pas vraiment parler français, je comprends un peu et utiliser Google translate pour m'aider à converser lorsque cela est nécessaire. La technologie est formidable. Thanks Sim - I don't really speak French, I understand it a little and use Google translate to assist me in conversing when necessary. Technology is wonderful. Hello! I just wanted to let you know how much I love your website! I mentioned it in my blog post today if you want to see. Hi Su - I'm so glad you found me and are enjoying the site. That was so kind of you to mention me on your blog. The collection of Ackermann PNG ladies you mentioned are some of my favorites and I have them both here on my EKDuncan blog and also on my devianART account at http://eveyd.deviantart.com/gallery/ (they are in their own folder for Vintage Fashion Plate pngs). I will be putting together another set with 18th Century fashions and also the silhouettes later on down the line. So much to do and so little time. 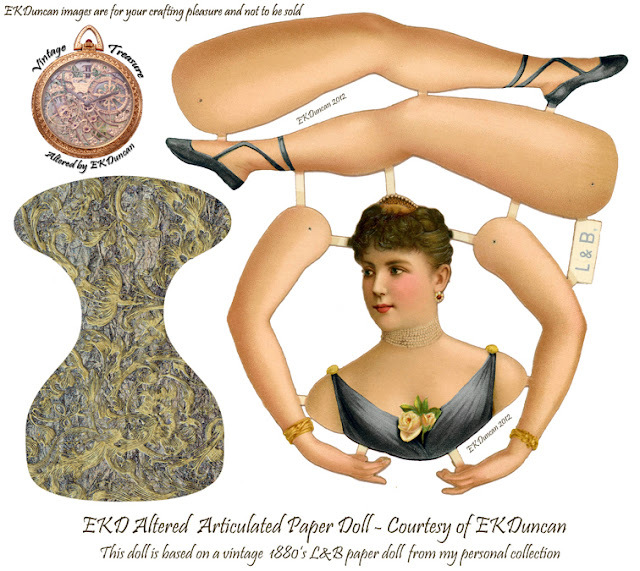 I have seldom be more enchanted and captivated by the work of a blog artist...you are an amazing master of manipulating the vintage images and paper dolls you have. Thank you so very much fo all of the work you do. It is eye candy for the weary modern eye. 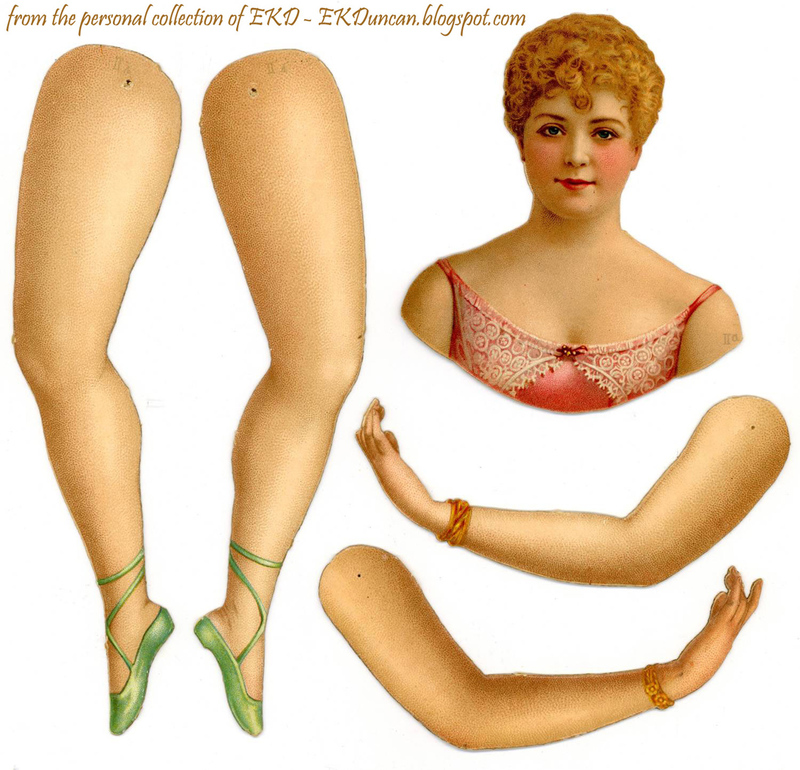 I am so inspired to make a little Halloween paper doll now with your beautiful vintage scrap. My heart thanks you so much and sends many blessings to you for sharing your work. Hello Karla aka Miss Peach and welcome!!! 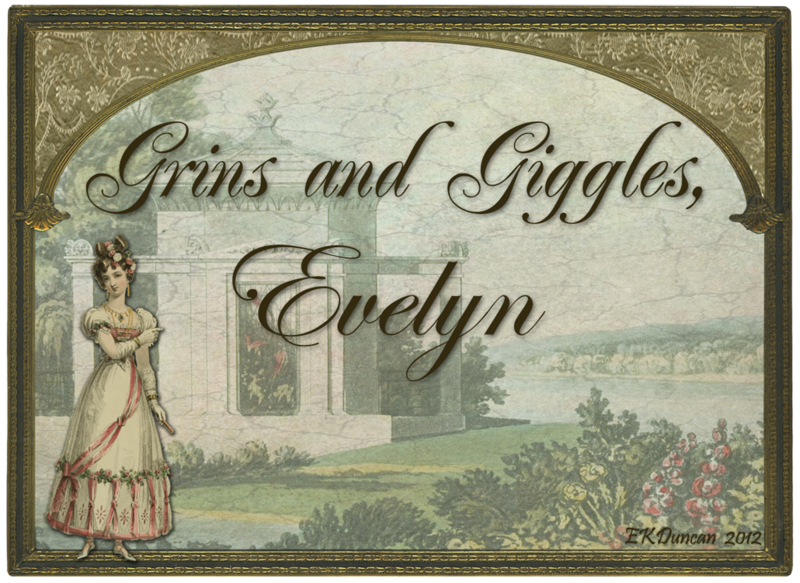 Thanks so much for all the kind words about my blog and artwork. I'm thrilled to have the opportunity to share it with great people like yourself and am always excited to here it inspires others to create original art. 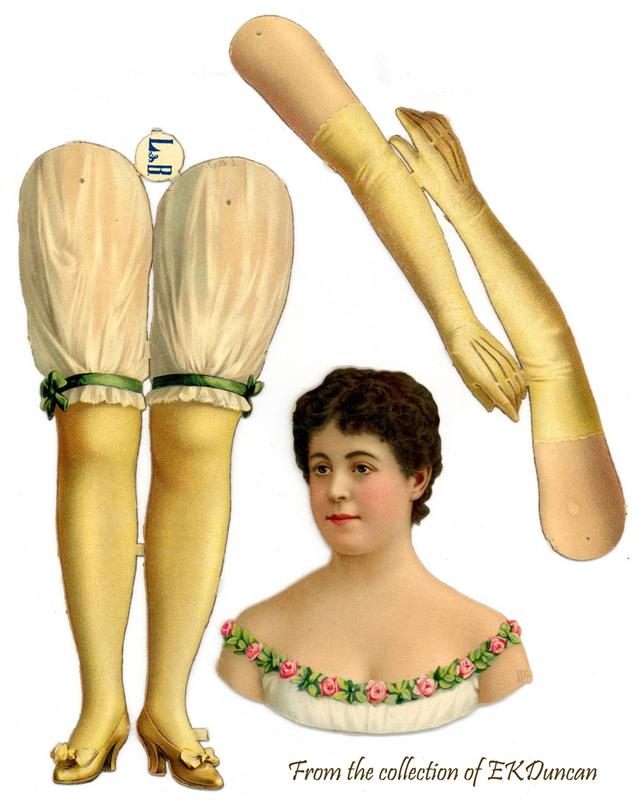 I'm sure you Halloween doll will be spectacular. It is a delight! I love silhouettes!!! Also, it can be used as masks in software for cutting out shapes in digital papers with different patterns. I love your theater of shadows, it's very original. Thank you infinitely! Hi Sylvie - Thanks for letting me know you like it. Silhouettes can be a lot of fun and there are so many creative ways to play with them both using technology and good old fashioned paper, scissors and glue. Oups, thank you for the interesting website link. I did'nt know the National Portrait Gallery and it's very interesting. 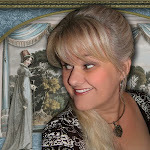 I am a fan of Jane Austen, so the Jane Austen's World is also one of my favorite blogs. 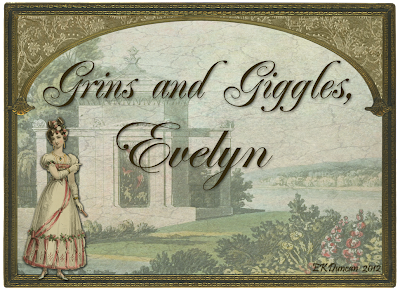 You are welcome Sylvie - I try and leave links for interesting resources when I find them and this one was a really good one and was perfect to include with this post. I'm glad I was able to provide you with a new resource for your research. I'd believe Jane Austen's World has a large following. I like to browse her blog on occasion and I now follow her Pinterest board too. Hi, I really like the work you've done here! I was wondering if I could get your permission to use a few of the Late 18th Century Fashion Silhouettes for a poster I am designing for a local Sense & Sensibility play? Would be great if I could hear back from you soon. Hey Jay - I'm glad you like the silhouettes and you are welcome to use them as described in your note. The costumes here are Georgian fashions and about 20 years earlier to the fashions that would be associated with "Sense and Sensibility".